Can £599 Ultrabooks cut it? The new Lenovo U310 - style over substance? 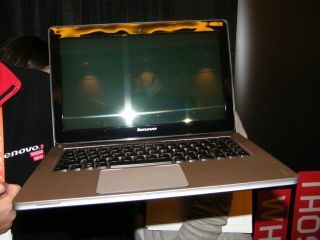 Lenovo has already been out in force at the CES 2012 pre-show events here in Las Vegas. As well as the IdeaTab K2 and IdeaTab S2 tablets that we saw, there are also new 13 and 14-inch Intel Ultrabooks too. Yep, more Ultrabooks. Anybody else spotting a theme? As we revealed in our news on the launch, the IdeaPad U310 and IdeaPad U410 are the first Ultrabooks confirmed to have more "attractive price points" (Lenovo's words) starting at £599. That really does bring Ultrabooks into a more mainstream price point. Here's the IdeaPad U310. As you can see the keyboard and chassis are rather gratuitously Mac-alike, but appears to have the quality we've come to expect from Lenovo. However, these aren't really thin and light notebooks like the already launched IdeaPad U300s. The 13-inch U310 is 1.7kg with a thickness of 18mm, while the U410 is 21mm thick and weighs 1.9kg. Here they are atop one another, in a kind of notebook sandwich. The button you can see opens the lid. As you'd expect from an Ultrabook, there'll also be fast resume and up to eight hours of battery life. It's certainly a smart-looking thing, isn't it? Although, having said that, we think Lenovo could have done a better job with the ports. It's not clear what processors these new units will pack, but signage on the Lenovo stand we saw indicated that the notebooks would have Core i5 processors. It is possible there may be a Core i3, while the cheaper model will come with a rather paltry 64GB SSD – though a 500GB standard hard drive option will be available in the UK. So our impression of these new models is a little reserved. Lower priced and great-looking they may be, but you get inferior features for that, while they're not proper ultraportables - and when PC World is doing £400 laptops with great specs and not a great deal more weight, we'd question whether they can really impress customers. It looks like a classic case of style over substance, but we'll have to wait for our full Lenovo IdeaPad U Series review to pass a final verdict.